“The global release of the BlackBerry KEYone from TCL Communication has far exceeded our expectations so far. This announcement sees BlackBerry smartphones now available in more than 30 countries around the world, while we continue to lay the groundwork for more releases in the near future,” said Alain Lejeune, Global General Manager for TCL Communication’s BlackBerry Mobile brand. The re-imagined BlackBerry features a matte black finish on a sleek aluminium frame and soft grip textured back built to offer the best in durability. It also has a 4.5 inch touch display that features Corning Gorilla Glass 4, offering greater impact and scratch resistance. The Black Edition features 4GB of RAM and 64GB of internal storage, while still supporting microSD expandable storage up to an additional 2TB. “The demand and excitement for the BlackBerry KEYone across the globe has been fantastic. We congratulate TCL Communications for bringing the KEYone Black Edition to the market so quickly, and know it will provide the performance and trusted security people expect from the BlackBerry brand,” said Alex Thurber, Senior Vice President and General Manager of Mobility Solutions, BlackBerry. Featuring the largest battery ever found in a BlackBerry smartphone, the BlackBerry KEYone Black Edition offers all day use and then some, with up to 26 hours of mixed use thanks to the 3505mAh battery. Qualcomm Quick Charge 3.0 technology enables up to 50 percent charge in roughly 36 minutes. The BlackBerry KEYone Black Edition reimagines how we communicate with a Smart Keyboard that goes beyond typing. Up to 52 customisable shortcuts transform each letter key for quick access to your favourite apps and most important contacts. Touch navigation responds to touch gestures like a trackpad, to quickly scroll through webpages or emails. The device includesa keyboard embedded fingerprint sensor conveniently located in the spacebar to provide added device security. The BlackBerry KEYone boasts a 12MP rear camera with an industry leading camera sensor (Sony IMX378) that captures sharp, crisp photos in any light. The wide aperture lens with large 1.55μm pixels and dual-tone flash ensures your photos will have superior colour and clarity. For times when you have to take a video conference on the go, the device includes an 8MP front camera with fixed-focus, LCD flash and 84-degree wide angle lens. What really sets the BlackBerry smartphone apart from any other android device is the enhanced security features built into every device. 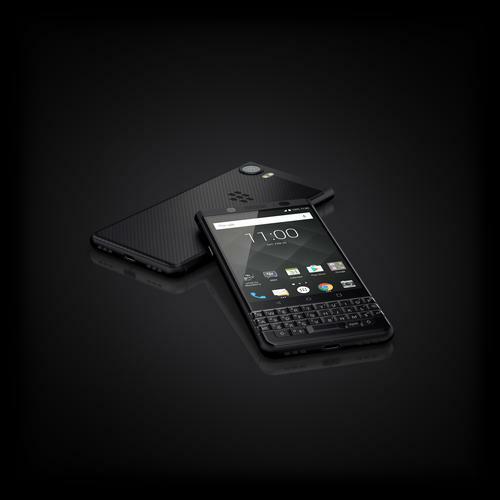 From a hardened operating system to BlackBerry Limited’s proprietary technique for establishing a hardware root of trust adding security keys to the processor, the BlackBerry KEYone is designed to offer a secure android smartphone experience. The BlackBerry KEYone Black Edition is available in Australia for RRP $899 from JB Hi-Fi.